Posted by elizabethwong in Event, Note2Self, Writings. My left eye narrowed to relook at the numbers. Admittedly this blog has been a little slow (and rather restrained) in the past months, but here’s hoping things will pick up before the end of the year. Thank you everyone for dropping by! PS. Rockybru is 7 million (plus plus) this week! 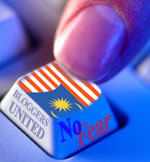 Posted by elizabethwong in "We can do better", Columns, Malaysia, Note2Self, Politics, Writings. I read, with horror and frustration, that once again, university authorities had the gall to walk into dorms and harass students. My latest column is a reflection of this frustration, which has been in my thoughts for a week now. Eight years ago, amidst the sound and fury of Reformasi, one of the student leaders went missing. Let’s just, for the moment, call him “Mr. Respectable”. He was after all, a proponent of ‘respectability’ and ‘respectable’ dressing among the student activists. I thought it was one of those local odditities, considering it was only a few years ago when we wore what was considered then, haute couture for student activists – tank tops, dirty black jeans, Blundstones faded to a hue of purple, sometimes with a flannel shirt and a scarf around the neck, in anticipation of delights such as a hot sunny day or tear gas in downtown Sydney. A week later, we discovered he was holed up at Armada Hotel, Petaling Jaya. Between room service and cable TV, he made furtive calls, arranging meetings with Reformists to offer anything their hearts desire, so long as they saw ‘his light’. Posted by elizabethwong in Columns, Current Affairs, History, Malaysia, Writings. A new online magazine, Bolehland.com, premiered a fortnight ago, featuring 12 columnists under 40. They include Brian Yap (who has a column in NST and soon to be a film-star); Fahmi Fadzil (actor); Li Tsin (Malaysiakini journalist); John Lee (frightfully bright 17-year old who’s been writing on politics and current affairs for the past 2 years); Nat Tan (editor of ‘Mahathir vs. Badawi’ – a book still on the top 10 bestseller list); and many others. My piece came out last Monday. Around this time of the year, we gorge ourselves, willingly or otherwise, at the buffet table of unlimited servings of sepia images and faded texts; this year with a little more pomp and frenzy, partly spearheaded by officialdom to put out a good show and partly fueled by the government’s recent reaffirmation that Malaysia is an Islamic state. While there is ample critique of the government’s use and abuse of ‘history’, not much has been said or written on contradictory reactions, bordering talismanic and involving equally solemn rituals of:- (1) whipping out the Federal Constitution (original) (2) reciting the Rukun Negara; (3) bringing forth the spectre of the ‘Social Contract’ (original) and (4) invoking the spirit of the (original) Merdeka Declaration. Posted by elizabethwong in Columns, Economy, Malaysia, Note2Self, Politics. Permodalan Nasional Bhd (PNB) has asked for an extension, from January 15th to the 29th, apparently due to disagreements with Synergy Drive Sdn Bhd, led by the CEO of Sime Darby Datuk Ahmad Zubir Murshid, and merchant bank CIMB. PNB owns owns 39.4 % of Sime Darby, 64.7 % of Kump. Guthrie and 51.8 % of Golden Hope. While news of the merger of these <em>Big Three</em> centre on the combined ownership of plantations, very little is said about the rest of the assets, which are in turn extremely lucrative businesses, including real estate, engineering, construction and others. Posted by elizabethwong in Economy, Human Rights, Malaysia, Op-Eds, Writings. Santa must have had trouble getting to this part of the world, since it was only today he came a-calling at Sapura with a surveillance contract worth RM 1 billion. Bernama’s Tengku Noor Shamsiah Tengku Abdullah reported late this afternoon on the likelihood of Sapura securing a Federal government contract to supply 3,000 cameras in major cities in the Peninsular, in anticipation of Visit Malaysia Year 2007, as well as for ‘security’. Earlier in March this year, Sapura-LTAT Communication Technologies Sdn Bhd won a RM 500 million contract to supply 3,000 Malaysian-made and designed tactical field radios to the armed forces. Posted by elizabethwong in Columns, Current Affairs, Malaysia, Politics, Writings. (NST Pix by Shahrizal Md Noor) My box of dusty Christmas lights and weathered decorations lie unopened, the gifts unwrapped. Every fifth person I know is frantically sending out Christmas e-cards and SMS greetings before the phone networks overload with messages of peace and giving. I’ve never been terribly fond of Christmas, barring the occasional Bing Crosby songs. I confess I do like relatively painless family gatherings, the quirky gifts and the company of close and old friends. But the fates have decided to make this occasion pricklier than in the past. The great deluge has taken at least half a dozen lives (and counting), and has all but drowned any holiday joy for close to a hundred thousand people in West Malaysia, unveiling the crassness of Christmas in all its glory. Posted by elizabethwong in Columns, Democracy, Human Rights, Malaysia, RIP, Writings. Some two hundred people, from friends to civil society leaders, dropped in at Pak Lang’s Bangi house to offer their condolences and prayers for the departed. Those present included Dr. Wan Azizah Wan Ismail, president of People’s Justice Party; Syed Shahir, president of Malaysian Trade Union Congress; Dr. Hatta Ramli, Treasurer of PAS and Kuala Lumpur’s own bon vivant, Hisham Rais. Reformists. NGOs. Students. Writers. Editors. It felt almost like a reunion of our restless generation. There were others in their cars and vans, racing from Perak, Penang and Melaka, unaware that the burial would be conducted in a matter of hours. Amin, who lives in Korea, asked if he should take the next flight back to Kuala Lumpur. The send-off was not for a titled person or a celebrity. He was neither a tycoon nor a political dignitary. 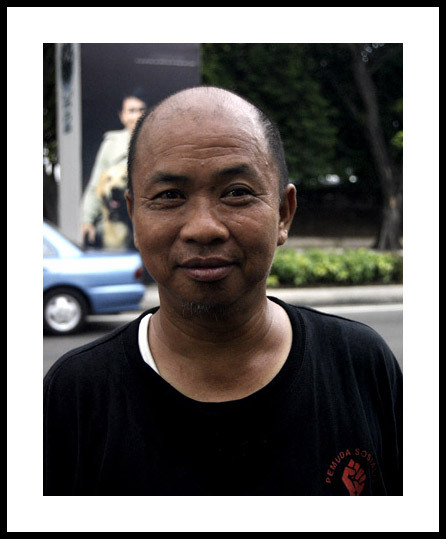 Tan Soi Kow (who, of late, went around as Umar Tan Abdullah) or just plain old ‘Ah Tan’ was a most ordinary man who made our lives most extraordinary. Unbeknownst to most Malaysians, even those who unabashedly wear the velveteen tag of “human rights activists”, Tan was without doubt one of the most committed fighters for democracy and human rights in this country. But one would be hard pressed to find a feature on him or read his words laid out on glossy magazines. Posted by elizabethwong in Current Affairs, Malaysia, Note2Self, Readings, Writings. What a most ordinary way to spend the eve of the 49th Merdeka anniversary — listening to 4 persons speak for 3 hours on the Constitution. Apparently I missed out on some singing at the start of the forum. Or not. I found it strange that the national celebrations will be held in Kuching this year, considering Sarawak didn’t form part of Malaya in 1957. A bit like celebrating Bastille Day in French Guyana. In fact, I found it strange to be here this time of year as I’m usually abroad for my summer break. From today onwards, I shall think of Naguib when I think of Merdeka day. Naguib Mahfouz, one of the Arab’s world best-known literary figure passed away on 30 August.